Two (2) Rechargeable CR2032 Li-Ion batteries included. Caution: Must charge two coin cells together. Note: Batteries are supplied with a plastic insulator on the outer rim which must be removed before charging. With socket clips, this charger secures your rechargeable LIR2032 coin cells in place. Only compatible with the rechargeable LIR2032 battery. Safe and reliable: The power is automatically cut off when the batteries are fully charged. This smart charger is designed to fully recharge your Li-Ion coin cell batteries. In the charging sockets, special clips help keep the batteries in place throughout the charging process. With it's safe and reliable design, the charger will automatically cut off power to the batteries when they are fully charged. This prevents premature wear of the cells. The charger features easy to read LED lights that tell you the charge status of your batteries. Input: 110-240V AC input 50Hz < 50mA USA AC plug. There are three LED indicators on this charger: Test, CH, OK.
Test LED = "Solid Red"
Charger will automatically cut off power when the batteries are fully charged. 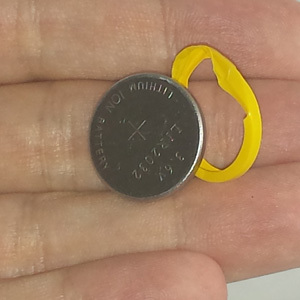 To protect the batteries, the LIR2032 rechargeable batteries are supplied with a plastic insulator on the outer rim. This insulator must be removed before charging. This charger is designed to charge two (2) batteries together. You must always charge two batteries at the same time when using this charger. Great way to save money on expensive coin cell batteries. Just wanted to let other guitar players know that these Coin Cell LIR2032 batteries work with the D’Addario Planet Waves NS Micro Clip-On Guitar Tuner that uses CR2032 coin cell batteries. The batteries come pre-charged...make sure you remove the yellow plastic wrapped around the battery otherwise it won't work in the Tuner. I bought a bunch of extra batteries...they also work in a rechargeable solar flashlight that I have. Very nice to be able to recharge button cell batteries. A lot of uses for these batteries. Battery Mart's purchasing department constantly works with suppliers to offer our customers the web's best prices. But we cannot guarantee our negotiated rock bottom prices on Charger for Rechargeable Coin Cell LIR2032 with 2 Batteries will remain this low after April 23, 2019. Buy today for $11.75 and save ($11.75) (-inf%).